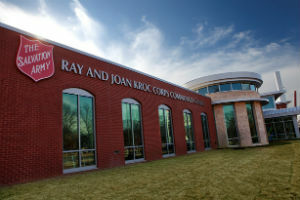 The opening of the latest Ray and Joan Kroc Corps Community Center in Norfolk, Va., this weekend will be the second to open this year, leaving The Salvation Army with two of the 27 centers left to unveil. Approved to receive funds to build a Kroc Center in 2005, The Salvation Army Hampton Roads Area Command plans a weekend of activities to kick off ceremonies tomorrow. The most recent Kroc Center to open was in Memphis, Tenn., where a 100,000-square-foot facility opened in February. A Kroc Center in Camden, N.J. has scheduled a ribbon-cutting for October. The would leave the 27th and final Kroc Center, planned for Staten Island, N.Y., as the last remaining facility to open. The centers were the result of a $1.5-billion bequest left in 2004 by Joan Kroc, the widow of McDonald’s founder Ray Kroc. The mammoth gift stipulated that half of the money go toward construction of new community centers in underserved areas around the country. Local affiliates approved for the funding were required to raise the other half of the funds for construction. Once the estate was settled, the gift totaled more than $1.8 billion and was distributed to the Salvation Army’s four territories between 2005 and 2010. Each territory administered $450 million it received, and set requirements on how much local affiliates were required to raise to match the Kroc gift, which would fund construction and part of the facility’s endowment. The Salvation Army in 2009 acquired a former hospital site for Kroc Center planned in Staten Island. The Salvation Army continues to discuss the Staten Island Kroc Center and expects to make a “definitive announcement” regarding the plans for this location by this fall,” according to The Salvation Army’s Greater New York Division. In some areas, Kroc bequest dollars earmarked for Kroc Centers were canceled due to difficulties raising local matching dollars and eventually were disbursed to other centers. The first wave of Kroc Centers opened in 2008, including San Francisco and Atlanta. The Memphis Kroc Center raised approximately $26 million locally to match $59 million from the Kroc gift ($30 million for construction and $28 million for the endowment). The goal was to raise about $28 million for Norfolk facility, with $56 million in Kroc funds to support construction and endowment.